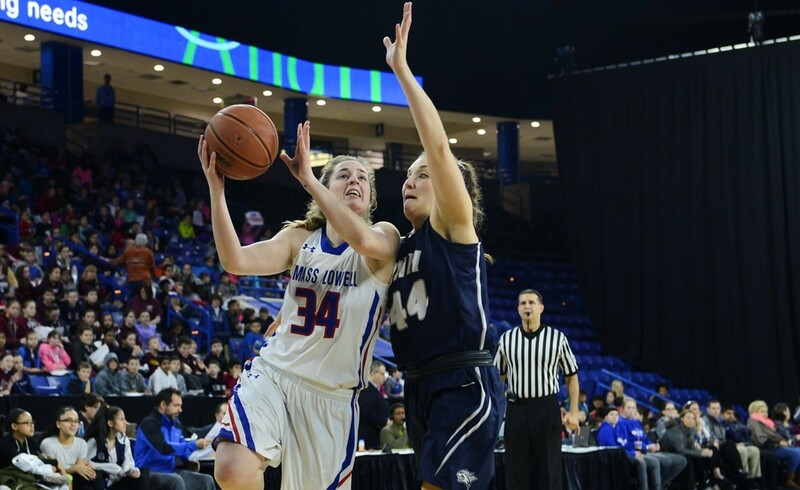 The UMass Lowell women’s basketball team suffered a loss to the UAlbany Great Danes in Wednesday night’s America East matchup. UMass Lowell fell to a 3-19 overall record, and a 0-9 America East record. Despite a strong first quarter, UMass Lowell was unable to carry its defensive pressure and creative play into the remaining 30 minutes of game play. “Tough game to watch. We spent a lot of time prepping for Albany and I think it showed in the first quarter,” said head coach Jenerrie Harris. UMass Lowell saw its only lead of the night in the opening period, which also featured five ties and two lead changes. The River Hawks were able to put up 17 points in the first quarter, nine of which came from junior forward Kayla Gibbs. Gibbs ended the night leading in rebounds, with 15, and points, with 16, for UMass Lowell. Senior forward Nicole Hayner also made her presence felt throughout the night, notching two three-pointers and 10 total points. Off the bench, sophomore forward Oda Shackelford scored eight points for UMass Lowell, all in the first half. Defensively, the River Hawks played a strong first quarter. Pressure from the River Hawks kept the game within three points until the end of the first quarter. “They zoned us early on and we had great ball movement out of it. I thought that our guards got the ball into areas that were open and I thought that our posts did a good job at having some nice interior passing and then finding the weak side people,” said Harris on the first quarter success. The second period saw momentum change for UMass Lowell. Offensively, the team was able to put up 15 points in the quarter and Hayner sank two three-pointers towards the end of the half. However, turnovers plagued the team. The River Hawks turned the ball over ten times in the second quarter, with each player turning it over at least once going into the half. The home team faced a ten-point deficit going into the half. UMass Lowell was unable to change the trend of the game in the second half. Putting up only ten points in the third period, the River Hawks struggled once more with turnovers and fouls, earning 10 turnovers and 9 fouls in the third period. UMass Lowell ended the night with 31 turnovers, with each player having at least two. The River Hawks were also unable to contain the Great Danes offensively. The visiting team scored 26 points in the quarter, their highest scoring quarter of the game. The third period also saw the largest lead of the game for UAlbany, who held a 30-point lead over the River Hawks for over two minutes. Going into the final quarter, the River Hawks trailed by 26 points. The last period saw the River Hawks put up their highest-scoring quarter. The team put up 18 points while the Great Danes only put up 11. However, as fatigue set in, UMass Lowell was unable to rally from behind, despite a strong quarter from freshman guard Markayla Sherman, who put up six of those 18 points for UMass Lowell. The night ended with a three-pointer from Sherman in the final seconds in the 60-79 loss. UMass Lowell returns to action on Feb. 4 to face Binghamton in New York. They will return to Lowell for a Feb. 6 contest against Stony Brook. The game will begin at 7 p.m. at the Costello Athletic Center.